Yesterday afternoon I was running errands and thinking about what I wanted for dinner and suddenly I knew - I HAD to have poppyseed chicken. So I called Laurie to verify the recipe. If you are from the south, or have ever had a baby, or had a family member die, or have gone to a church potluck -you have probably had or made poppy seed chicken. But in case you haven't - I thought I would share the recipe. Harper loved it. I am not even going to tell you how many plates full I ate of this last night. Laurie said she craved this the entire time with Sarah Kate. Mix the first 4 ingredients and put in a baking dish. Cover with crushed up ritz crackers. Melt a stick of butter and pour on top. Bake for 20-30 minutes at 350. I serve mine over rice. This is SUCH a good comfort food!!!! So it's game day!!!!! I've got our flag hung on our house! I decked our car out in car flags and magnets but I had to make a quick trip to Wal-Mart and when I came out - SOMEONE HAD STOLEN TWO OF MY MAGNETS. I WAS SOOOOOOOOOOOOOO FURIOUS!!!! Who does that??????? So now we have just have one on each side. But on a happy note - they FINALLY put a hog in the center of our field. It looks so good. They just finished it yesterday. We should have done this 30 years ago. The Petrino era starts tonight and I am so excited. My parents are on their way over to see us and eat a late lunch with us before we all head to the game! Have I mentioned I love this time of year? That recipe sounds fabulous, I'll have to try it! I cannot believe it is already FOOTBALL season!!!! I am so excited, I've been cleaning house with College Gameday on the tv and Fall candles going! Now, lets get some cool, crisp fall weather. Have fun at the game, I am super jealous that you will be at a game while I watch on tv! 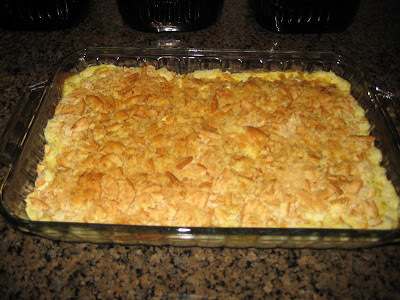 The chicke recipe looks yummy! Hope Harper enjoys her first football game! Have fun. I LOVE, LOVE, LOVE poppyseed chicken! It's so yummy! I haven't made it in a while though. It may have to go on the menu for this week!?!!! My husband would eat this everyday if I would make it, it's his absolute favorite meal. I've never tried poppy seed chicken, but I will now! I can't believe someone stole your magnets, that is just wrong. 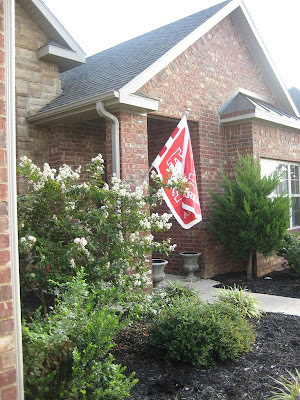 I love your front porch flag! That is on my list of things to buy for my front porch! Have fun at the game! GO HOGS! Never had this, but I am making it this weekend. Oh so yummy!!! Thanks for sharing that recipe. I think I've had it before, but obviously, it's been a while, so I can't wait to make it!! I can't believe someone stole your magnets! How dare they!! Oh, well! Have fun tonight! I'll be watching the OTHER SEC team - Roll, Bama, Roll!! Well, this is the 2nd blog I've read in a week with the recipe for Poppyseed chicken, so maybe it's fate that I try it for the first time. I'm going to see how the 2 recipes differ. Hope you have a great time at the game!! I love football weather too. Oh, and for the record. "Those" kinds are all over the world, I had magnets of our school mascot stolen off of my vehicle at the school one time too. Made me sooo mad. And I had just bought it and put it on earlier that evening from the booster club!! UGGG. Oh yes mam, love me some poppyseed chicken! I totally thought we had the same dishes (by Dansk? ), but mine aren't white in the center. They are very similar though! Boo to whoever took your magnets...that's just wrong! Have fun at the game! My sister left me a message the other day asking if the poppy seed was really an important ingredient in Poppy Seed Chicken. It cracked me up. I guess she was thinking maybe they don't have a lot of flavor and hoped she didn't have to make an extra trip to the store, but seriously? Poppyseed chicken without the poppy seed? Yum! One of my favorites! My mom used to make it all the time when we were younger. Thanks for causing an immediate craving!! :) I think that might have to be dinner one night this week! P.S. Yes, I do use Dr. Seale! She's the best! I'm SO jealous! Hubbie is getting ready to leave for the game, but I can't BEAR the thought of leaving Caroline so soon! Looks like the tent and grill will have to wait for the 2nd home game in 3 weeks! Have a great time!! I like the new hog, too! Great Blog! I invite you to vistit www.PowerUpLove.com. A community of real people sharing real stories about how Love has really impacted and changed their lives. Hope you have a great time with your family at the game & with Little Harper (of course). We bought some custom letters from here for Emma's room and they were PERFECT. I just sent them fabric samples and they were a 100% match. Also thought you might be interested in googling Penny Laine Papers (out of Dallas, Texas), their baby books are expandable and oh so cute. You can even order extra paper and just print your own stuff or titles at the top of the pages to add whatever you like. Oh, and while it is on my mind, though far away...don't forget to throw a couple plastic page protectors in your hospital bag that they can use after they stamp Harper's precious little hands and feet, so the ink does not smudge. This was some great advice a Mommy shared with me. I really like things nice and neat, so I was glad I knew this upfront. I love the bedding you have chosen and the nusery is going to be fit for a Princess! Mmmmm I LOVE Poppyseed Chicken but my husband hates it!! Can I come over and eat some please??? :) Another good thing to try is instead of the poppyseeds you can put in sliced almonds. Yum...I might make him eat this tomorrow for lunch!!! The chicken looks yummy. I will have to try that recipe on my husbnand sometime this week! Hope you have fun at the game.. We are just watching the weather here and wondering which way Gustav will go! Have a good rest of the weekend! All I have to say is... WORD! I LOVE poppy seed chicken and it doesn't get better than football season! I am sitting here at Mom and Dad's blogging and watching AL play Clemson (go Tigers!). Derek can eat his weight in some poppy seed chicken. Who doesn't love Ritz crackers smothered in melted butter. I mean, whoever came up with this was genius! It's just divine. 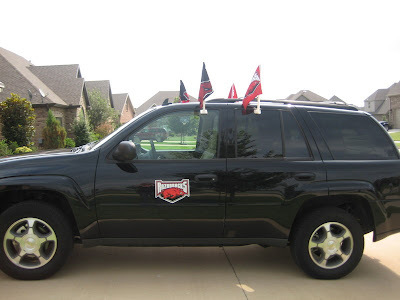 You should get some sort of honor like Best Hog Fan or something. I CAN NOT believe someone would steal your magnets. What in the world??? I hope you and your mom and dad have a great time. I know you will. Right now, as I type this, we are behind. I hope we catch up second half! 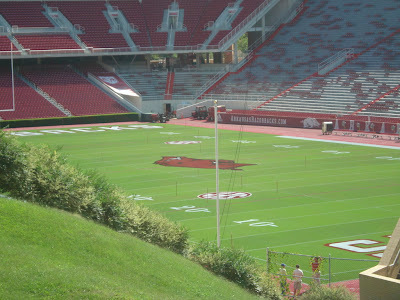 I agree, the hog on the field looks great and they should have done it a long time ago. We've never had our magnets stolen, but we had a concrete Hog in our flower bed and it got "pranked" a few times. The first time, it was in the middle of our driveway. We thought we had some crazies in our neighborhood, but it ended up being a good friend of ours. After that incident, we found the Hog on the roof of our house once AND in front of our car at church one Sunday. (That was the funniest, b/c a lady at church walked up to me and said, "Is that your pig out there?" and I was like, "WHAT???" She said, "Your razorback, is that your razorback out there?" and I looked outside, and there was our concrete pig sitting in front of our 4-Runner.) Our friends had been at our house the afternoon before, and they took it somehow when they left! I mean, the pig is like 30 pounds, so it wasn't like it was some real easy thing to mess with! We did steal someone's magnets once...at Wal-Mart. They were our friends and we gave them back to him later that evening. It was pretty funny. Maybe that's what happened to your magnets...someone pulling a prank. Thank goodness the team pulled it out. We were sitting on pins and needles in Louisville listening to the game on the computer! Okay..I wrote a novel. Sorry. I also never told you congrats on the girl! You will love having a girl! That is so funny! I was at the grocery this morning and had to call home to get Brandon to check the fridge for sourcream! Im making poppyseed chicken tomorrow night!! haha! Only thing is I came home to find that I now had everything for it except the crackers...back to the grocery! & shame on whoever took those magnets! I cannot believe that about you magnets! That is so wrong. Hope ya'll had a wonderful football weekend!! This looks soooo good! I would like to make it and I have a very silly question...please do not laugh!! How do you boil the chicken?? I have never boiled chicken so I have no idea! Melissa - no cooking question is a dumb question. Just fill a pot half full of water and put on the stove until it's boiling. Drop in 2 or 3 breasts of chicken (frozen or fresh) and boil for about 20 minutes (longer if frozen). It will cut in pieces very easily - just make sure there is no pink left or boil a little longer! Thank you Kelly!! I hope you are feeling great this weekend. Have a blessed Labor Day. Poppy seed chicken is my favorite! To save time and money, I just use canned chicken. It is not as good, but it makes it so fast and EASY. That chicken looks so good, but there is no way I will be able to recreate that. If only we were neighbors I would be crashing your dinner about now! Stole your magnets? That is low. Yum-you've made me hungry for poppyseed chicken for sure! I love me some poppyseed chicken! Too bad about that car magnet..that's just sorry. Yaay for the HOGS win! our family loves this recipe! and how easy is it to put together. we've been talking lately about "fall" foods and this is a great recipe to start out the season. think i'll run to the store today and pick up the ingredients. thanks for reminding me of it. enjoy football season (we're msu fans...) and so glad i found your blog. i enjoy it often!!! take care. I have totally made that before! Same recipe and everything! And I love that it is easy to half when I am just cooking for me and the hubs! You are looking fabulous! Glad you haven't been too sick! That recipe sounds divine! I will absolutely be trying that soon ;)! Oooh...I love the HOG in the middle of the field. It add so much ;)! Yum! I love poppy seed chicken! I am glad you had a nice weekend! Hi Kelly! Hope you are having a good day- I just had to get on here and tell you that I made poppyseed Chicken for lunch today! I totally thought of you when I was doing it! I NEVER cook at lunch- we normally just do easy stuff- but today I could not wait until dinnertime! hey kelly ~ i am 17 weeks pregnant and i am now craving poppyseed chicken!!! i actually just boiled my chicken!! yum! my husband and i are HUGE auburn fans so i totally understand the obsession with the SEC! J gave me the recipe for poppyseed chicken years ago and it's a fav at our house. I've never served it over rice, so I'll need to try that!! 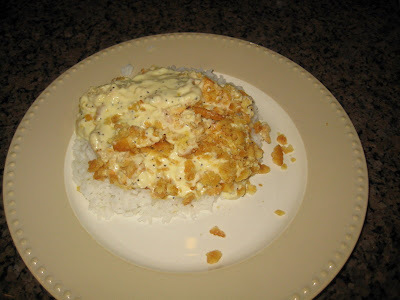 Poppyseed Chicken is a family staple in our household!! I fixed this recipe last night and it was a huge hit! My 5 year old got up this morning talking about it and asking for it for dinner tonight. I also fixed it for a friend who is sick..thanks for sharing! I love poppyseed chicken!! It took me almost a year to find poppyseeds in NYC so I could make it! We have ours with white rice too! I make that recipe alot too! So yummy!!! we LOVE POPPY SEED CHICKEN-no one up here in WA has ever heard of it so whenever people come over to eat-they ask us to make "that southern chicken stuff." it's the best!!! love all of the Razorback things-and congrats on having a girl-love the name! so sweet! ps-you look amazing by the way! I know this is an old post, but I just found your blog (via Candice Watters) and have been scoping out the digs here... catching up on your story. And lo and behold, not only do you make the hot ham sandwiches my mom makes, but you also do poppy seed chicken over rice!!! Girl, you are my food sistah as well as a sister in Christ!!! So... I just had to comment.